Hyspan has the capability to manufacture the industry's most complete line of metal bellows and assemblies that incorporate metal bellows. These products have a broad range of applications including scientific research, OEM products, automotive, aircraft, space and defense. Experienced engineering and project management staffs are available to meet the most demanding technical requirements. Hyspan's manufacturing capability includes forming of bellows, sheet metal and tubing as well as machining, welding and testing. Quality systems are in place that conform to the standards of the industries served. Hyspan manufactures a wide range of industrial products including metal bellows and packed slip expansion joints, pipe ball joints, pipe guides and struts, and venturis for flow measurement. 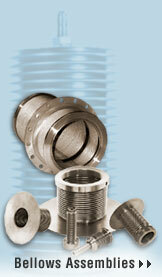 manufactures strip wound and corrugated metal hose.